Snakes are fascinating creatures. They’re beautiful and majestic… as long as they stay the hell away from my house. I am assuming like me, don’t want one of our scaled, slithery friends taking up home in your roofspace. Snakes are nature’s ninjas, tough as they are slick, silent, evasive and deadly. 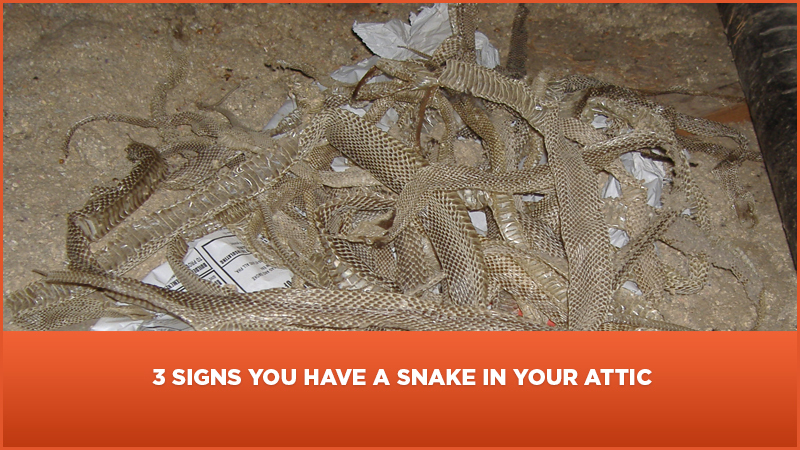 A snake can set up shop and live prosperously in a home for months, even years, before the residents are aware of it. Some snakes can go months without eating before it affects their health, so they can reside dormant, making little movement and leave hardly any evidence of their presence. So how can you know if there is a snake shacked up in your roof? Short of seeing it with your own eyes, it can be difficult, but here are three signs that can tip you off. Snakes are quiet, but they can still make a sound. A roof or attic can act as a speaker, reverberating anything that moves on or in it. Many people who have found a snake living in their roof have reported an actual “slithering” sound coming from above. There is a chance you can hear the sound of the friction between the wood of the roof and the snake slithering about it. If you hear inexplicable sounds from the roof that are infrequent and in different locations each time, this can be an indication there is a snake. Snakes do not need to eat often, which means they do not leave droppings often. Unlike an invasion of something like rats where frequent sightings of rat droppings is an obvious indication of their presence, snakes won’t leave much evidence behind. Even if you were to find snake droppings, recognising them as being of a snake is not a common skill amongst most people. One thing a snake does leave behind which is a complete affirmation of their presence is their shed skin. Snakes will shed their skin every few months or so, depending on how quickly they grow. The rate at which they grow depends on the rate at which they eat. The more they eat, the quicker they grow, the more often they shed. When they shed, they are vulnerable, as the old skin starts to become dry and tight around them. Layers of the dying layer of skin also form over their eyes, making it difficult to see, and their mood while shedding is usually an aggravated one. For this reason, when a snake goes into it’s shedding stages, it retreats to it’s home to ride it out until it is finished shedding and back to being fully mobile and “comfortable in its skin” as it were. A shed snakeskin is pretty hard to mistake, so if you find one anywhere in your house, this is almost a 100% confirmation there is a snake. Snakes eat rats. This is common knowledge. If you have a rodent problem and live in an area prone to snakes, then know that your house is something like a refrigerator full of delicious food. In short, rats will attract snakes, and rather than going into the wild to hunt, they will be very content to set up shop where it knows that food will be hand delivered. If you have a rodent problem, it’s probably a good idea to assume you have a snake problem as well.